The Richmond | "musings from a country house in the city"
"musings from a country house in the city"
This summer my cast iron skillet has become such a go-to tool that it seems to reside permanently upon by cook-top. In spite of its small cost – for many tasks it outperforms much more costly cabinet rivals – think Le Crueset and All Clad. The beauty of cast iron is that it distributes heat evenly and for charring you can get the surface white hot with no danger of ruining your food or the pan. It’s also highly versatile. 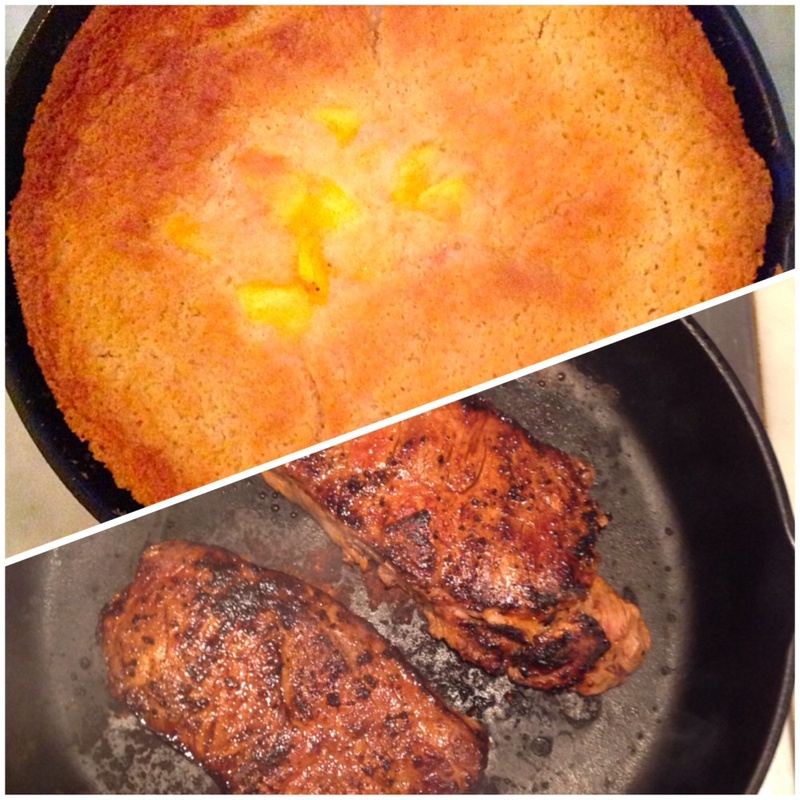 In this post I hope to tackle two uses which are markedly distinct – Pan Searing Meat (achieving a great charred crust with out the hassle of heating up your grill) and Cooking Cobbler (using a wonderful heirloom recipe from Virginia Williis). But first let’s start with the pan. I prefer The Lodge 12″ Version – it is big enough for multiple steaks and deep enough to fry chicken. Lodge Skillets come factory seasoned – so upon purchase they are ready to go. Plus I love that all of the 100+ year old company’s products are made in their Tennessee foundry. Cast iron gets better with age – as the pan further “seasons” after each use. This helps build flavor and also create a non-stick surface. A key thing to remember is that these pans should never go in the dishwasher – in fact I prefer not to use soap when cleaning mine. I simply fill the pan with water – bring it back to a boil – use a plastic spatula to scrape away bits – and then rinse. You can also use kosher salt as an abrasive to help scrub away stubborn spots. 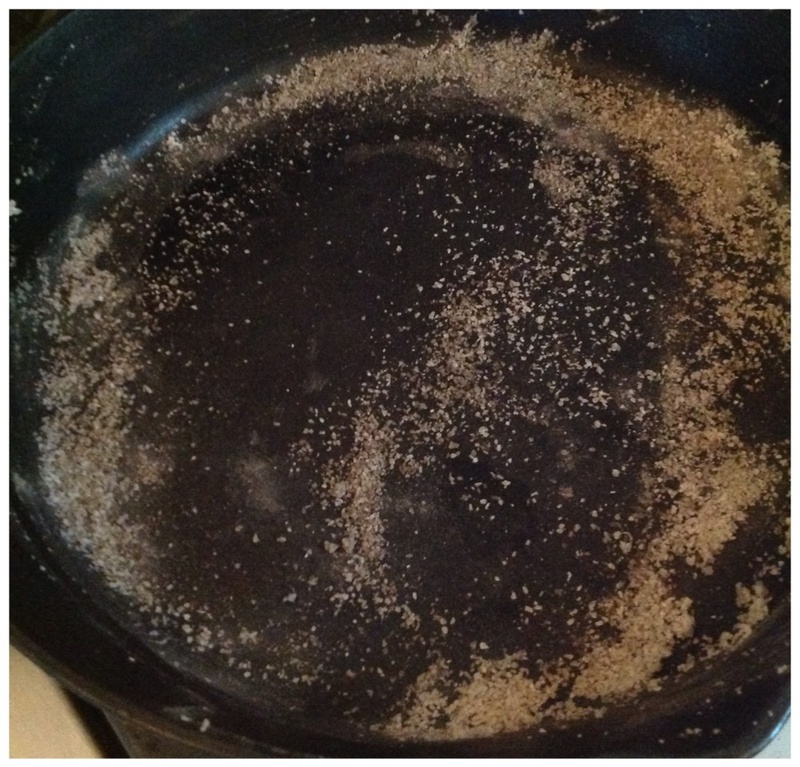 After rinsing I return the pan to the stove to get hot again – this helps evaporate water and prevent rusting. 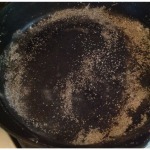 And finally before putting my skillet away I rub the surface with just a tiny amount of vegetable oil. For dinner parties at The Richmond you will often see multiple skillets going simultaneously. I love to use this technique for ribeyes and it is also great burgers. First select your meat – remove it from the refrigerator and place it on a cutting board. Give it a very light coat of vegetable oil or lightly coat with a non-stick cooking spray like Pam. Season the meat generously on all sides with salt and pepper and let it return to room temperature. 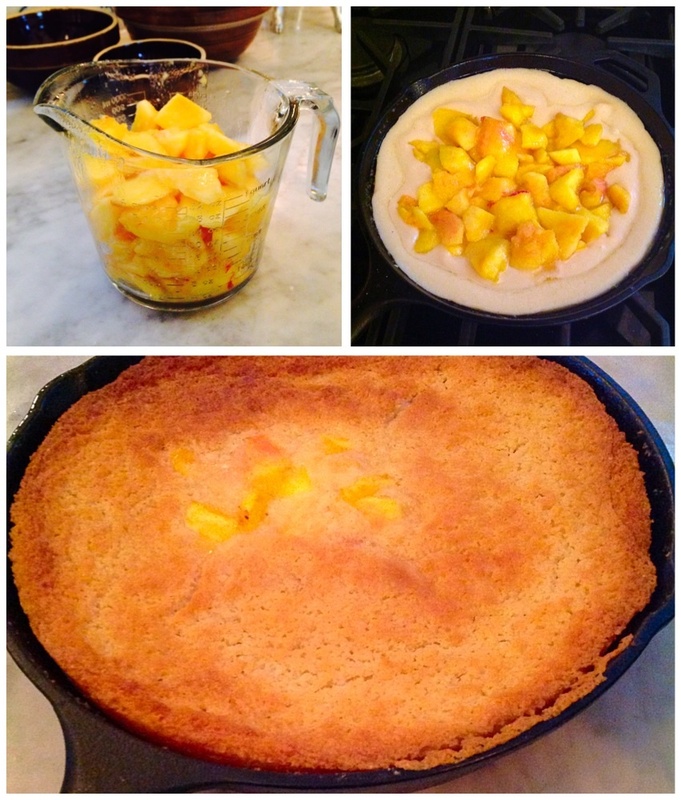 Meanwhile place your cast iron skillet over high heat for 15 to 20 minutes – or until the surface seems white hot. The pan should be so hot that it almost scares you. Place the meat on the skillet. 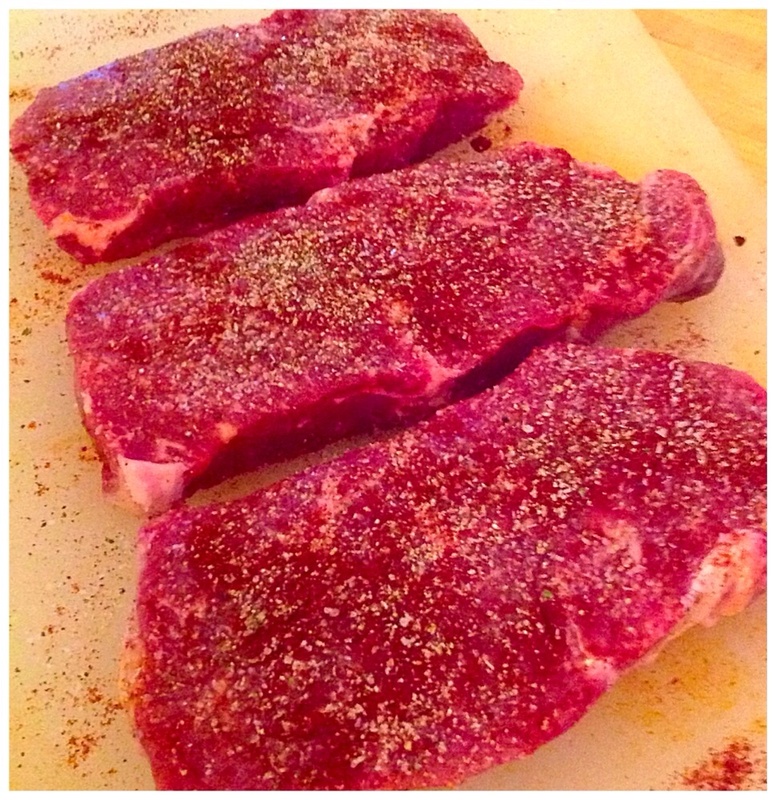 For 1 1/2 ” ribeyes sear them untouched for 3 minutes and then turn them to sear for 3 minutes more on the other side. Use a timer, be strict and you will end up with a perfect medium rare steak with a warm red center. Obviously you can adjust the cooking time up or down for more rare or well done temperatures or for thinner/thicker cuts. For burgers form 1 1/2 inch patties and cook 2 1/2 minutes per side for medium rare. To add a more decadent flavor – melt a few tablespoons of butter in the pan after you have removed the meat and the pan has cooled very slightly (you still want it hot enough to brown the butter). Return the meat to the pan for a quick coat on both sides before serving. 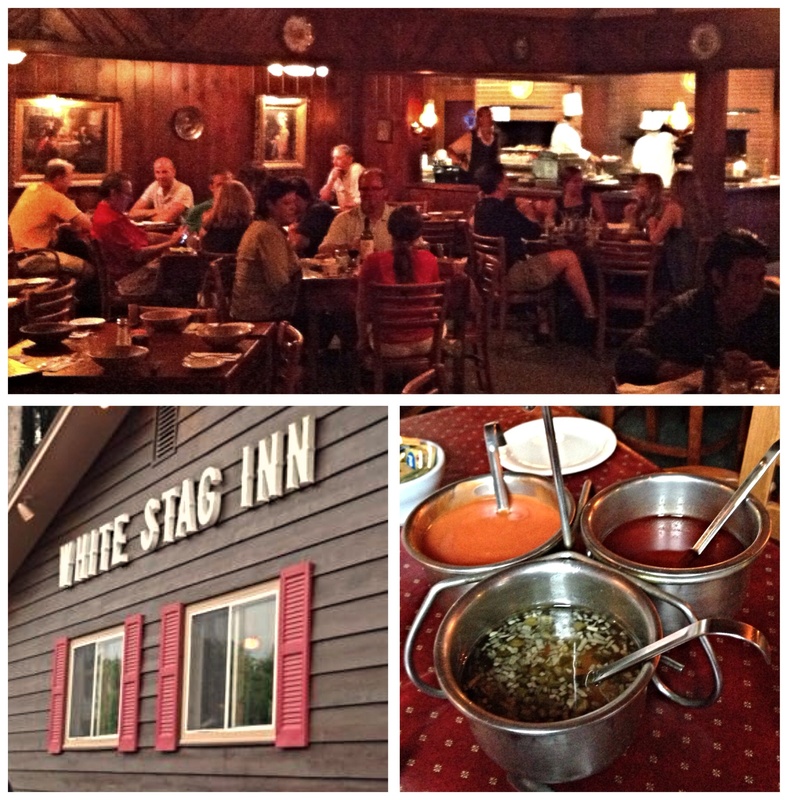 Last week we headed up to Eagle River Wisconsin to see Jim’s mom Ruth and take a much needed weekend off. We have been going to the North Woods for over a decade and by far my favorite attraction up there is the old school dining. Wisconsin is know for it’s supper clubs – a 1950’s throw back restaurant concept which is alive and well throughout the state. 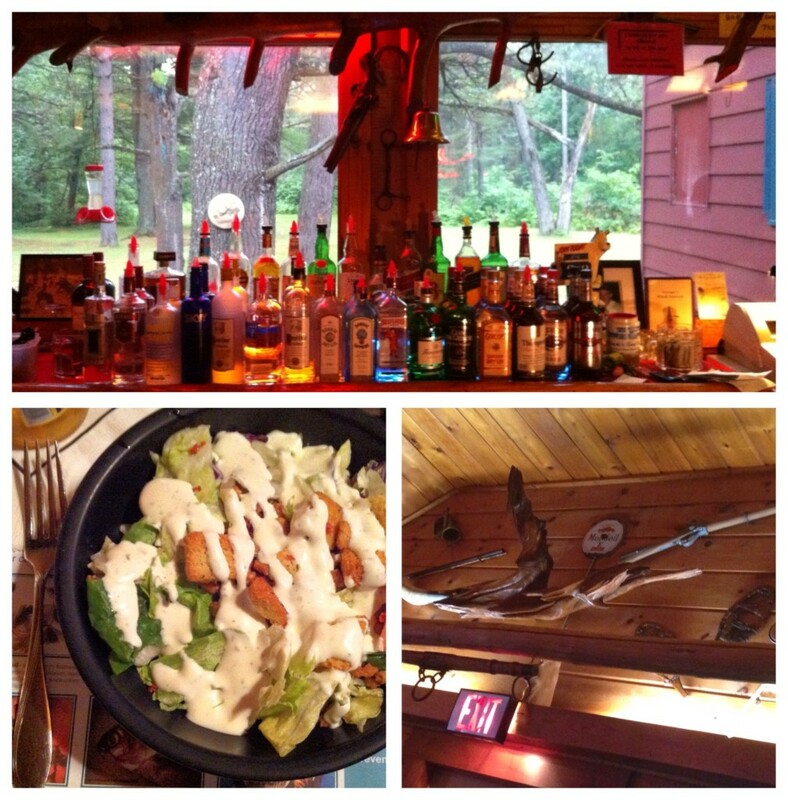 If you don’t know about this phenomenon – check out “In Wisconsin Supper Clubs are open to All” – a well researched piece by David McAninch for the travel section of The New York Times. There are plenty of places to choose from in the Eagle River vacinity, but after a lot of hits and misses through the years – the following two spots are our go-tos every time. 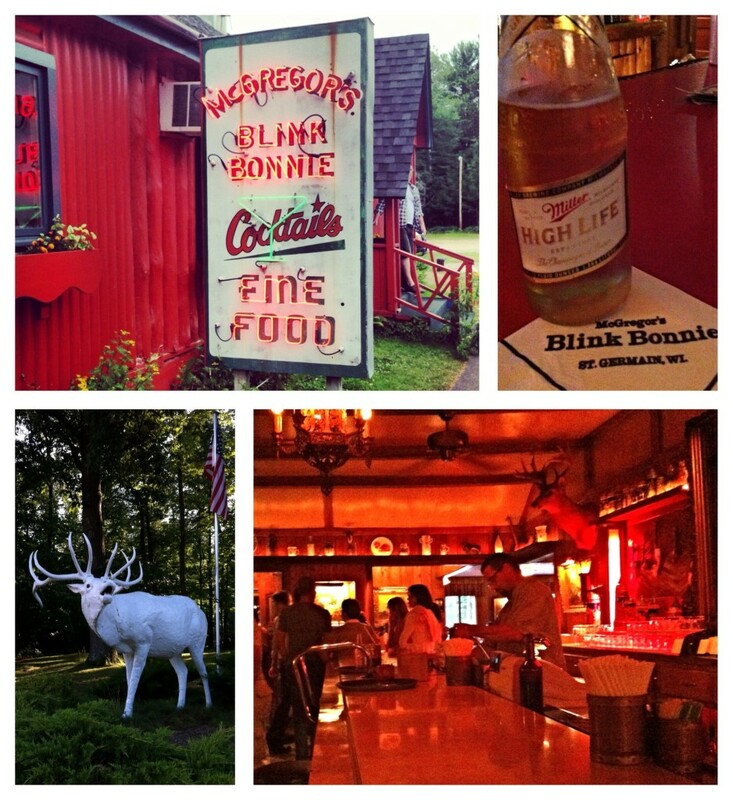 Both are located on country roads and have the old school vibe I am consistently drawn to. But don’t go expecting polished service or creative menu concepts. Instead revel in the community feel and menus geared towards carnivores. A client friend from the store first told us about this tiny spot hidden along a county highway outside of St. Germain. It almost looks like a red one room schoolhouse – with natural wood paneling, taxidermy and plaid curtains composing the interior. The place has charm in spades and feels like somewhere Don and Betty Draper might drop in on road trip. Highlights are the Brandy Old Fashioneds (which they muddle to order) and the Prime Cut Steaks (served sizzling on Armetale platters). The Steaks are certainly good, but it is the Homemade Hashed Browns and house-made Garlic Ranch Salad Dressing which are tops. You can add a few Fried Shrimp to any steak dinner – which you should do – because they are phenomenal. And because of the quaint nature of the small dining room, be prepared to wait, perhaps as long as two hours during the busy summer season. But seats in the separate bar area turn over quickly. And there is plenty of people watching inside and nature watching outside (through the giant aquarium windows behind the bar) to keep you occupied. You are on vacation after all, so just relax and make an evening of it. We had driven by this place dozens of times before first dining there last summer. Like Blink Bonnie this place is packed in the summers. But the scale of the restaurant is larger and accordingly the wait times are more manageable. Try and score a seat in the large dining room with the two massive charcoal grilling stations – this is where all of the food is cooked. The restaurant’s founder sold these grills wholesale in Chicago before opening his own spot in the North Woods. Today his grandkids run the place. Sadly they don’t muddle their Old Fashioneds – but they do make a mean Brandy Alexander which is a nice way to end your evening at the bar. Again, Steaks are the main attraction here – but Jimmy had a solid Smoked Pork Chop which might have been the best thing at the table. Dinners come with a salad and potato. For the salads Giant Wedges of Iceberg Lettuce are brought to the table along with a trifecta of house-made dressings (which are even better combined). For $3 you can add blue cheese crumbles – so go for it. Entrees are served from a stainless steel cart which wisks dinners from the broiler to the tables. A fun retro touch. The baked potatoes are huge and served with the restaurant’s own Cottage Cheese/Sour Cream Hybrid – also very tasty. Again, little has changed here since the 1950s – the room is paneled, dimly lit and filled with tons of European and North woods ephemera. A cozy place to tuck in and spend a relaxing evening. no reservations, or websites, for either place. 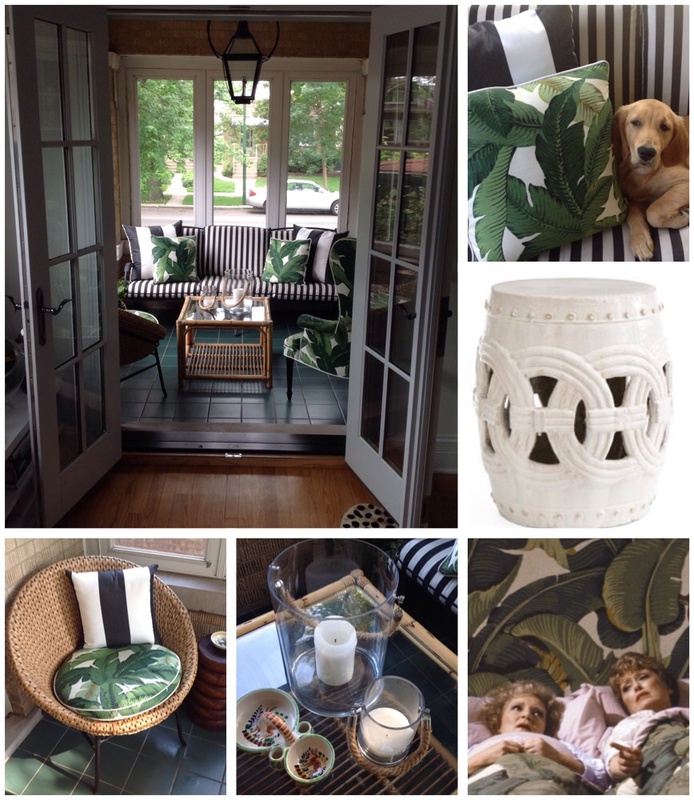 I have always been a huge fan of the iconic 1940s palm print. The version most lauded is the one developed for The Beverly Hills Hotel. 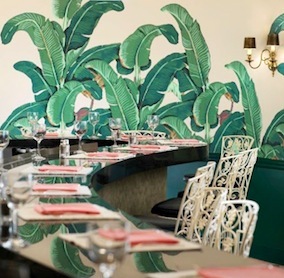 The iconic Martinique Wallpaper Pattern was specified by the property’s interior designer Don Loper in 1942 for use down the long corridors and in the iconic hotel coffee shop (pictured left). In the 1980s the print made an appearance on TV’s The Golden Girls – used as wallcovering and bedding in Blanche’s bedroom (see image below – anytime Hollywood Regency and 80’s Miami intersect – one has to take note.) 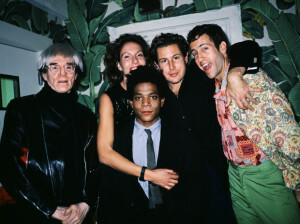 And in the early 90s it swathed the walls of the A-list Greenwich Village hot spot Indochine to a super-chic effect. The small screened in porch off of our living room has become a favorite summer gathering spot at The Richmond. Many a cocktail and tête–à–tête have occurred on the striped wrought iron sofa. This spring I noticed that the furnishings were beginning to look a bit ragged – so I decided to give the porch a little TLC. First up was finding a print to reupholster the Vintage 1950s Wingback (my chair). This is when the iconic stylings of the Beverly Hills hotel came to mind. I looked at the licensed Martinique Fabric used at the property – available through Designer Wallcoverings and Fabrics (they also sell the wallpaper). Sadly, they don’t make an outdoor version. 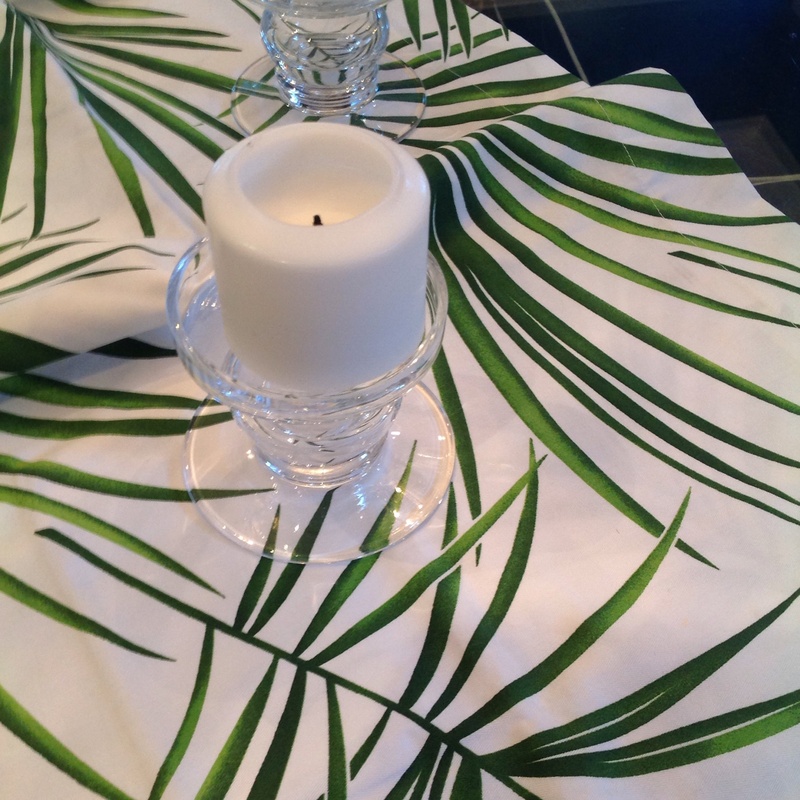 So after a bit more hunting I found a virtual twin – “Swaying Palms” from Tommy Bahama (I know). I wanted the space to feel old school, preppy, and comfortable (channeling two of my favorite muses – Albert Hadley and Brooke Astor). For that reason I decided to make it tightly coordinated and use only two fabrics – the Swaying Palm Print and Black and White Awning Stripe Sunbrella. 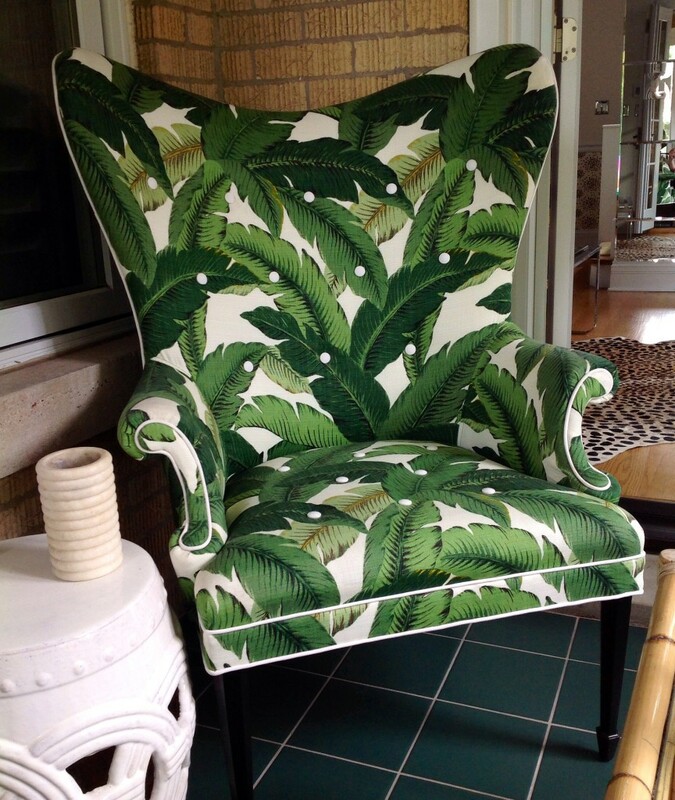 The custom cushion for the existing round rattan chair, and coordinating throw pillows, were all made in the Palm Print. And to convey a retro cabana feel, everything, including the wingback, was piped in Canvas White Sunbrella. I ordered a few great accents pieces from Wisteria – a favorite on-line resource. The Indian Rings Ceramic Stool in white (pictured above) as a side table for the wingback, and a pair of Nautical Rope Lanterns for the Vintage Bamboo Coffee Table (which was found at a local thirft store). To add just a bit of contrast, but stay on plan, I added Wide Awning Stripe Accent Pillows from Pottery Barn to the rattan chair and sofa. The stripe is just a bit broader than that used for the Sofa – but they are still made from Black and White Sunbrella. The end result is just as I hoped it would be. Cluby and cozy. A favorite spot for everyone. Especially our brand new puppy Loretta. I’m not Italian (I’m a WASP from Colorado). To me gravy is what you put on potatoes (not pasta). And when it comes right down to it I don’t really even like eggplant that much (like okra it seems there are more bad preparations than good). 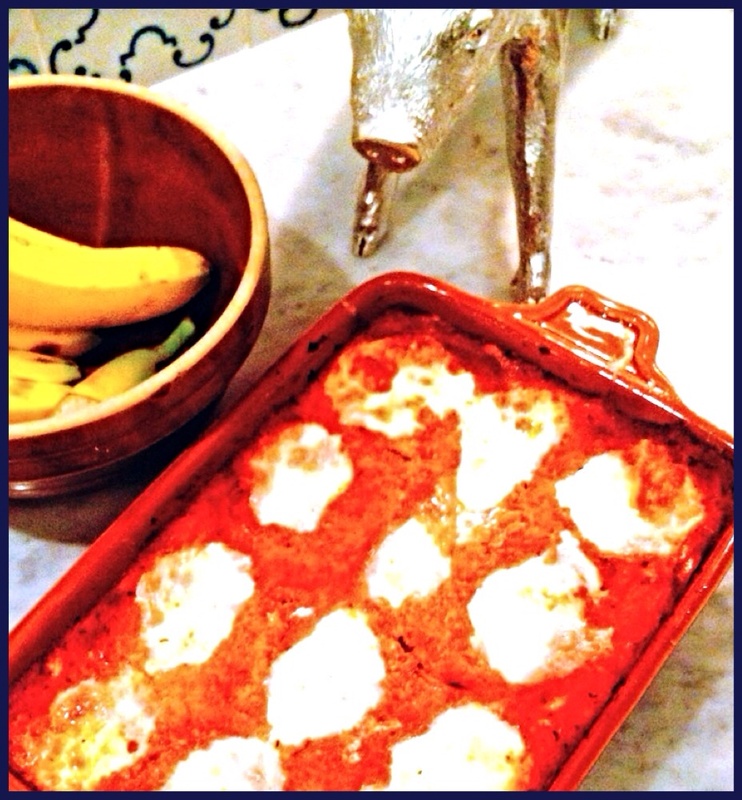 So it is hard to explain my recent obsession with Eggplant Parmesan. I seriously crave it and need a regular fix. It all began about a year ago when my Italian American friend Rosemary Bitetti came over with her daughter Amanda Puck to educate me about her technique. Like many modern day prophets she sat in her chair, drank vodka, wagged her finger a lot, and told me and Amanda exactly what to do. The end product was “perfecto” and after a couple more batches on my own I think I have it down. While I adore French food and wine, on our recent Paris buying trip I found that our typical binge on the super rich left me in a conundrum. After five days filled with dairy and complex sauces, all washed down with a lot of red wine, I found my palate at a stopping point. What to do? Despite my stomach’s limitations I couldn’t possibly waste a meal in Paris! So I decided to think like a Parisian. 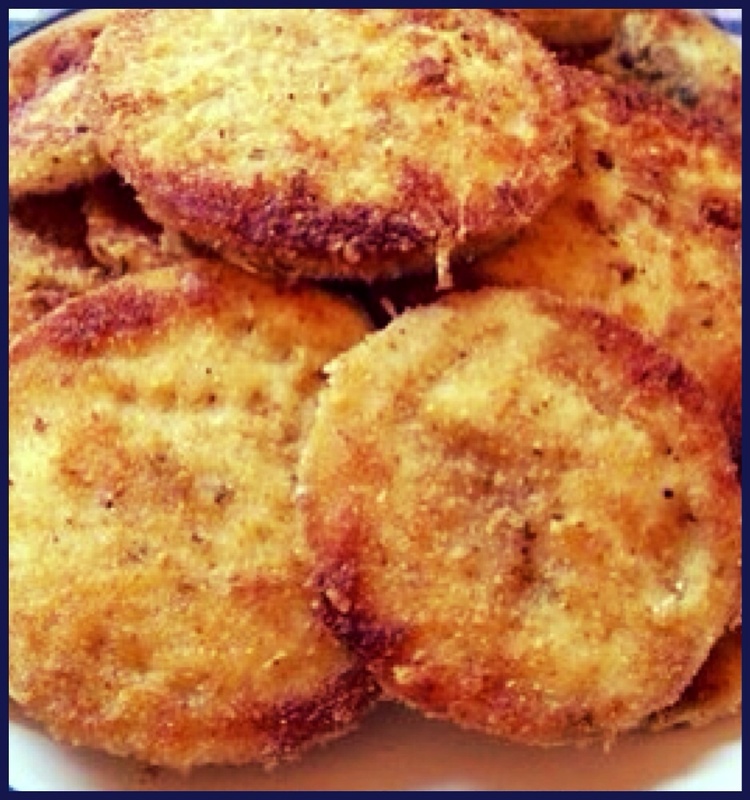 Certainly the food savvy civilians are not living on French cuisine alone. This thought sparked a memory of walking by a restaurant on our way home the evening before.The bright corner spot, near the Palais Royal, had no sign and a huge line out the door. All I could make out inside was communal tables filled with diners enjoying heaping bowls of Udon. The internet search was on . . . .
Online I soon discovered that the area I was walking through on the border of the 1st and 2nd Arrondissements is the “Little Tokyo” of Paris. 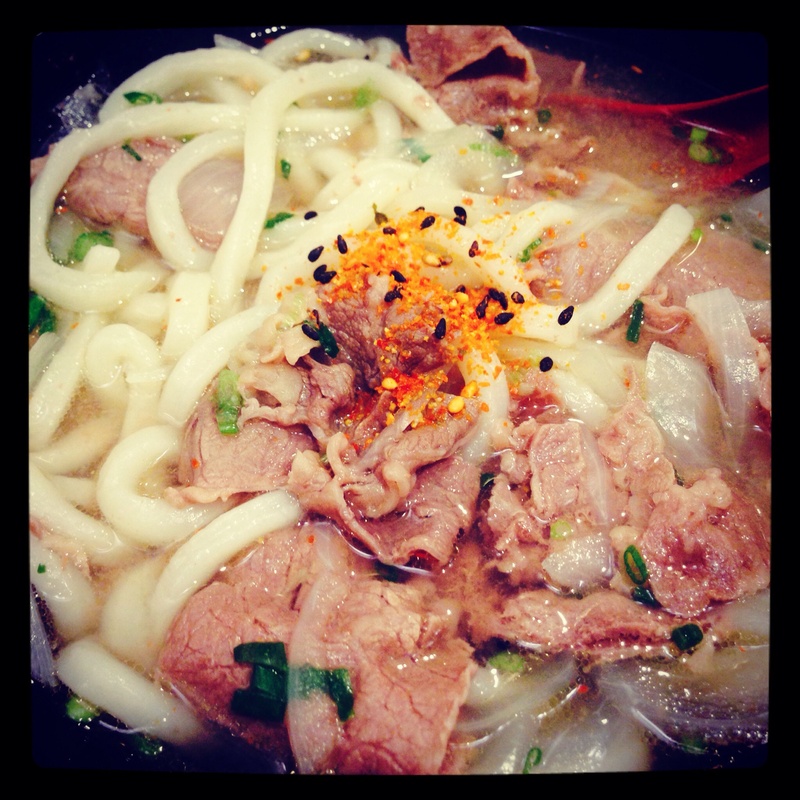 And I also learned that there is great debate about which spot serves the city’s best Udon. The restaurant we saw was Kunitoraya, which has recently relocated to this larger spot at 1 rue Villedo. The place has a huge online fan base touting their noodles as tops. The other major contender is Sanukiya: which I will have to reserve for a future trip (and post). 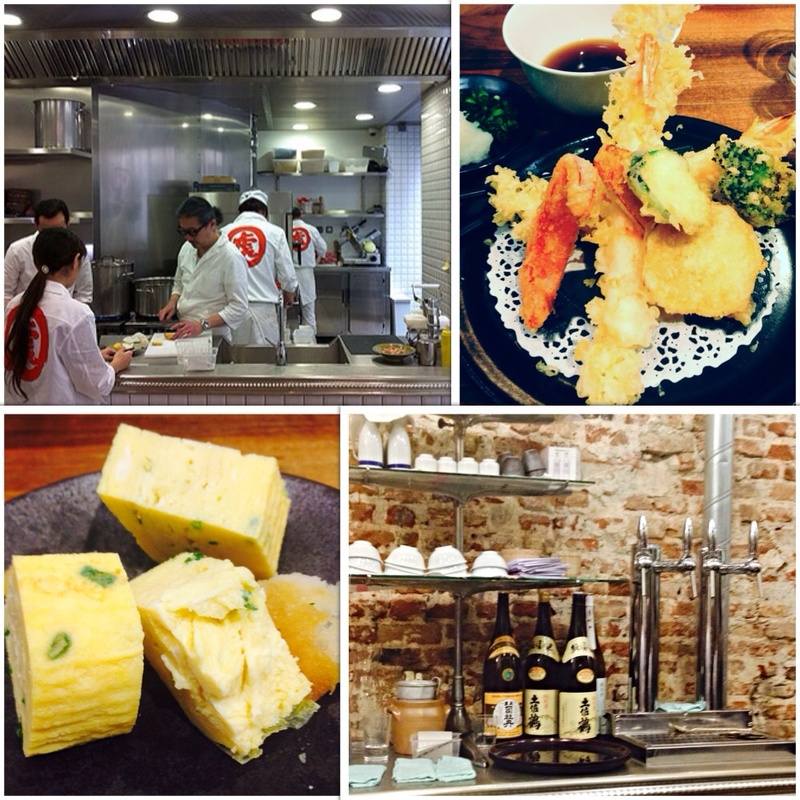 And don’t confuse Kunitoraya 1 with it’s fancier sister – called Kunitoraya 2 – down the street at number 5. The restaurant is open seven days week (well worth noting because finding quality places which are open on Sunday can be vexing). We arrived shortly before 7 and the line was already significant – but it moved quickly and we were seated about 45 minutes later. Standing outside gave us the opportunity to observe the tiny kitchen to glean clues about the food and menu. Once inside the wooden tables are mostly communal – so you are packed in tight. But this proved to be part of the fun – the bright exposed brick room was filled almost exclusively with French and Japanese people. The servers are all Japanese and they speak limited English. However, upon request, they do have an English menu – which was a huge help (without it I would have ordered my Udon bu Boeuf Froide – or cold). The menu is divided into three sections: Udon in Soup (hot), Upon in Soup (cold) and Over Rice. Basically you choose the topping and pair it with one of these serving styles. The two most popular seem to be the Niku Udon (Boeuf) which pairs tender slices of lean beef with a flavorful beef broth packed with Kunitoraya’s handmade noodles and the Komachi Udon (Crevette et Algues) which places delicately fried shrimp and vegetable tempura atop a bowl filled with seafood stock. We both went the beef route – but had a serious fear of missing out on the tempura. While waiting in line we watched the chefs masterfully filleting and deveining each shrimp prior to hand battering and flash frying them piece by piece. Luckily you can order the Shrimp and Vegetable Tempura as an appetizer- which we did – along with the traditional Japanese Omelette. 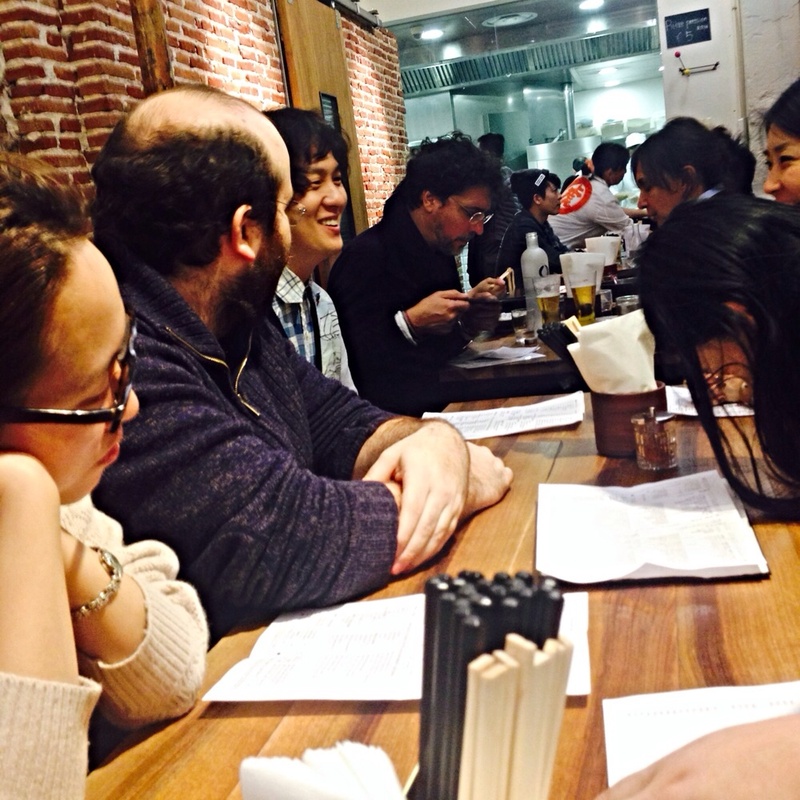 The meal began with glasses of ice cold Kirin – a welcome departure from red wine. Hot and cold Sake is also available. The omlette was good (enlivened by shredded radish) but the tempura was stellar. Maybe the best I have ever had. The pieces were light and perfectly crisp – the shrimp unmistakably fresh. Our Udon was also exceptional. The broth tasted richly of beef – and the meat was super tender. The noodles were toothsome and cooked just right. Our portions were huge and yet we felt compelled to finish every drop. Service was brisk and friendly. The waiters speak almost no English but were happy to help navigate us through the evening with lots of mutual smiling and pointing. 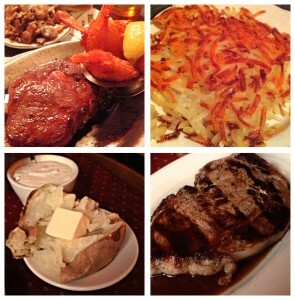 We left the restaurant satisfyingly full and content that we had enjoyed an authentic Parisian experience. And all of this was to be had for less than $100 for 2 people – a relative bargain in this part of the city. All in all Kunitoraya was just the change we were looking for. A wonderful palate cleanse which left me with zero angst about wasting a meal or food moment in the city of light. And if you are in Paris for just a few days this would be a great lunch option as it is located just a short blocks from the Louvre and shops along Saint Honore. Last summer when we were on vacation in Rome Jimmy and I spotted a huge Zara Home store in the Prati shopping district. The mega international retailer does not have homes stores stateside, so I was intrigued and wanted to see what the store was all about. I was expecting a lot of monochromatic uber-modern basics – much like what I see in their fashion collections. 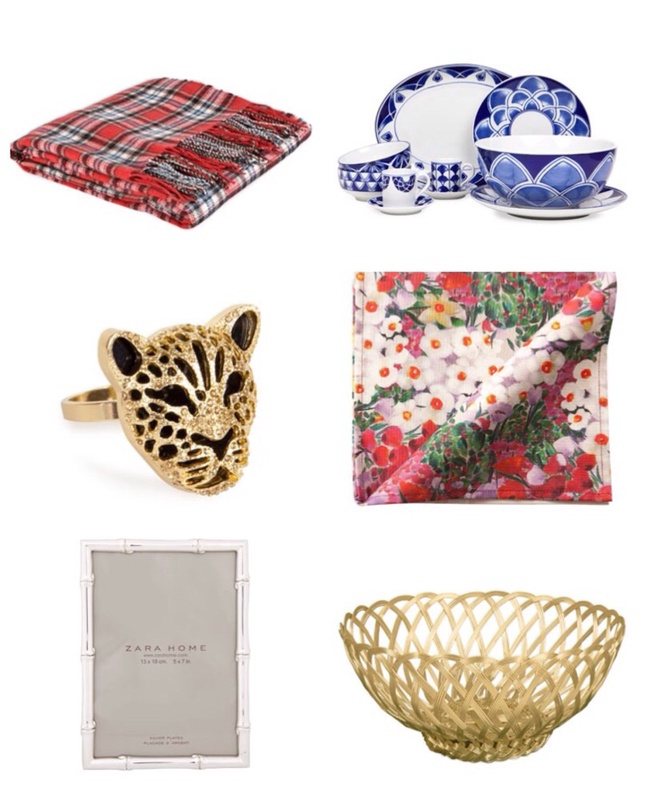 But instead I found tons of color and pattern – much of it reminiscent of the glory days of Ralph Lauren Home. 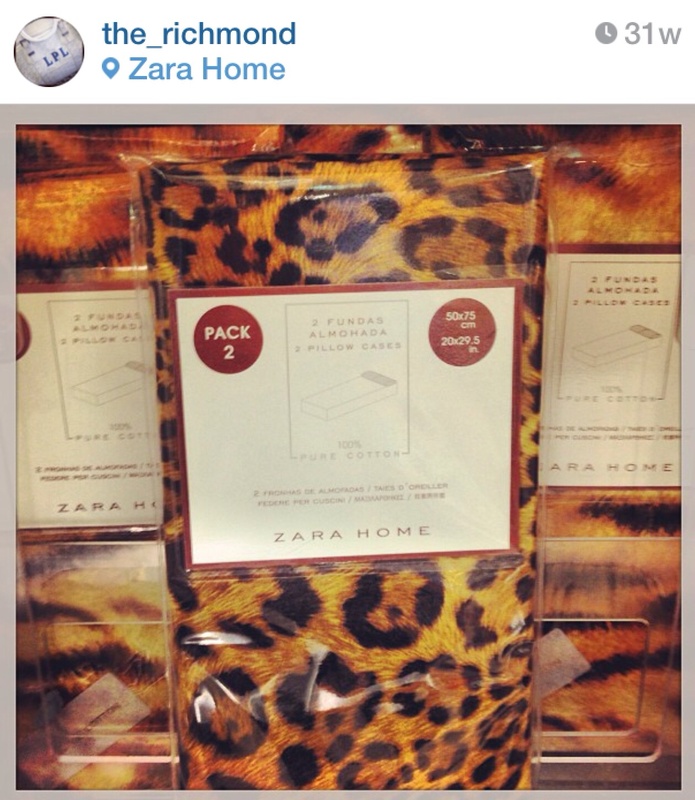 In fact I think I instagrammed their leopard pillowcases within a few minutes of setting foot in the store (they reminded me of an old RL pattern from the 1990s which I adore). And while they may look like Ralph they certainly are not priced like him; yet the quality is there. Nothing looked or felt like it was from Ikea. The design and construction was strong across many categories – from dishes to flatware, from small accent furniture to rugs. I was overwhelmed and impressed – but at that point our suitcases were jammed – so I left with only a Palm Print Tablecloth (pictured below). 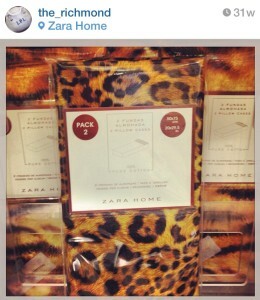 I had honestly somewhat forgotten about Zara Home until I was prowling the net last November for an animal print rug to finish out a spot in our living room. 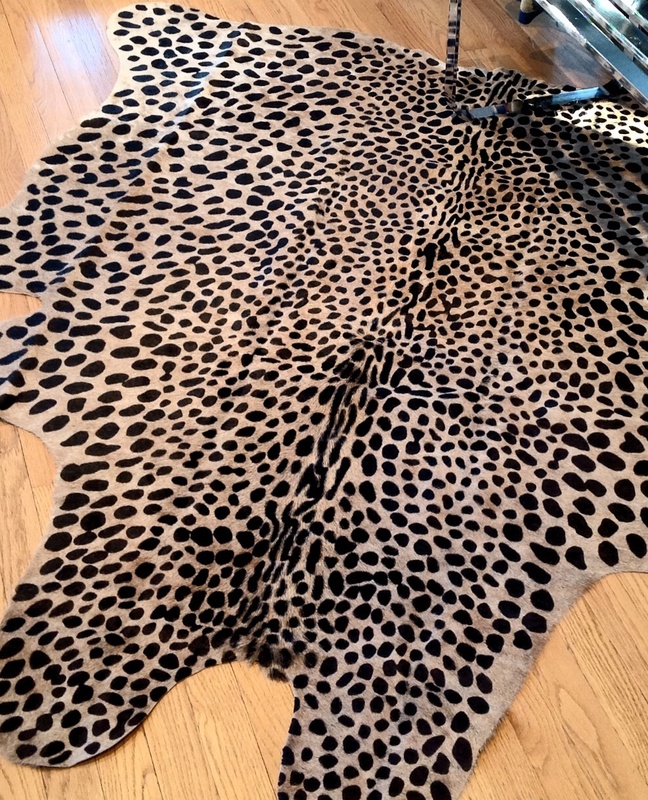 And then Eureka – I saw the insane leopard stenciled cow hide rug pictured in the opening photo above. It was fantastic. I loved that the colors were muted and the print sophisticated (there is such a fine line between cha cha and chic when it come to a leopard print). And the best part was that the rug was almost 30% less expensive than a similar designer version I had been eyeing. Even after my experience in Rome I was skeptical about quality – but upon arrival the product exceeded all expectations. It looks like a million bucks in my living room and got LOTS of attention at our annual holiday gathering. Now I was hooked. In December I began eyeing the whimsical bird’s leg side table. This time I found the price somewhat frightening. Not for the typical reasons -it seemed too low. For under $200 I was worried it would look completely plasticky and cheap. But again upon arrival the product completely delivered. 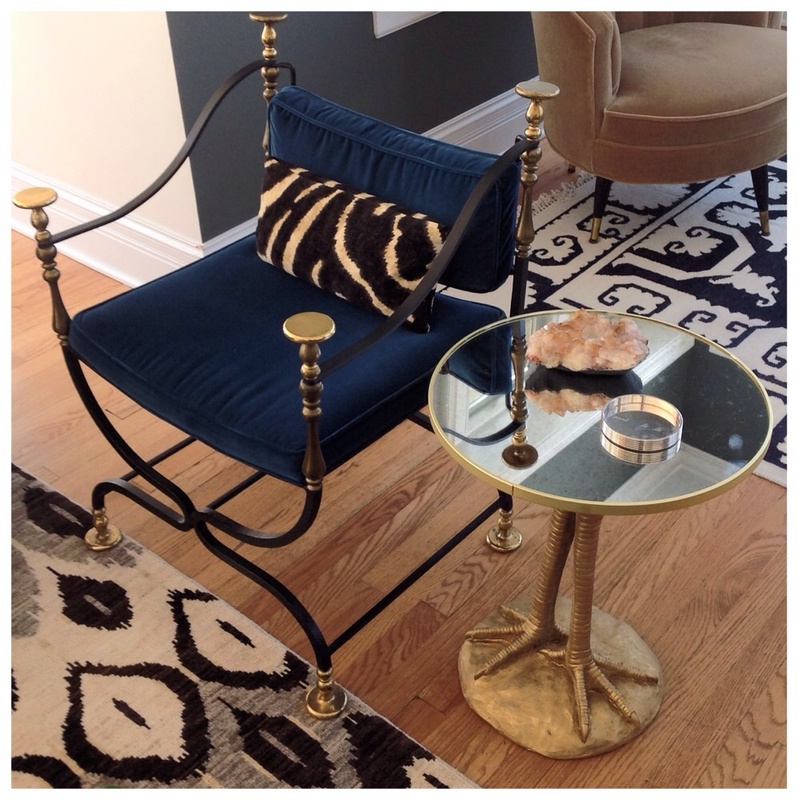 The mirrored top, the brass trim, and metallic resin work on the table were all extremely well done. I loved it. At the time of posting the piece is currently sold out. But do not fret – I see it is featured prominently in a promo shot for their spring collection so I bet it will be back online soon. This illustrates a key point about the site – buy it when you see it. I have missed the boat on several items because I waited too long to pull the trigger. And with the current free shipping and free return shipping offer – what is there to lose? So while we are waiting for the table and rug to come back into stock – here are six items I am obsessing about from their spring collections. So happy hunting. I purposely left the prices off so you too can be pleasantly surprised. Certainly not everything on Zara Home is my cup of tea, but there are lots of great items at prices that make sampling super angst free. Please keep me posted on your finds. I am Lance Lawson. The home I share with my partner Jim on Richmond Street in Chicago is a reflection of what I value most. The journey to express personal style. A place to gather with family and friends. The art of entertaining well. The joy of all things aesthetic. And it is always a comforting place to return to after a long day, or a magnificent journey. All of this is The Richmond. © 2013 The Richmond. All Rights Reserved.